Don't blame basement window leaks on the amount of rain. Likewise, the problem probably isn't due to the age or installation of your windows. The first things to are your gutters and window well drain. Here's what to look out for. Basement windows are great for letting natural light into subterranean space, but what if they also let in water? The culprit could be your gutters and downspouts. Check the gutter running along the roofline nearest the window well in question. Check, too, the nearest downspout—that is, the gutter leading from the roofline to the ground. If there’s a clog in both or either one, then excess amounts of water could be spilling right into the window well. That’s not necessarily a problem in itself, but it might be a contributing factor. If the window well was installed correctly, there’d be a drain at the bottom designed to let water permeate into the soil. If you don’t see a drain, dig down a few inches. If you still don’t see one, that’s a problem. In an exceptionally heavy rain storm—or in combination with a clogged storm drainage system—the absence of a drain could very well be the causer of basement window leaks. You can add a drain, but it’s not the easiest of jobs. 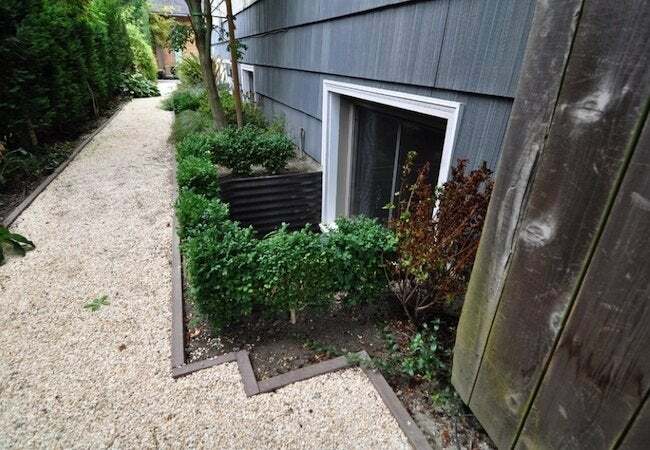 An alternative is to remove about two feet of the soil at the bottom of the window well, replacing it with crushed stone. Keep the level of the stone about three inches below the bottom of the window. That will help keep the water out. For added protection, hinge a clear window well cover to the foundation. Being clear, the cover will still admit sunlight without inviting in water, too.